Quickly and easily remove lipstick stains, grease, odors, and other soils from your bar glassware with this Noble Chemical 4 lb. 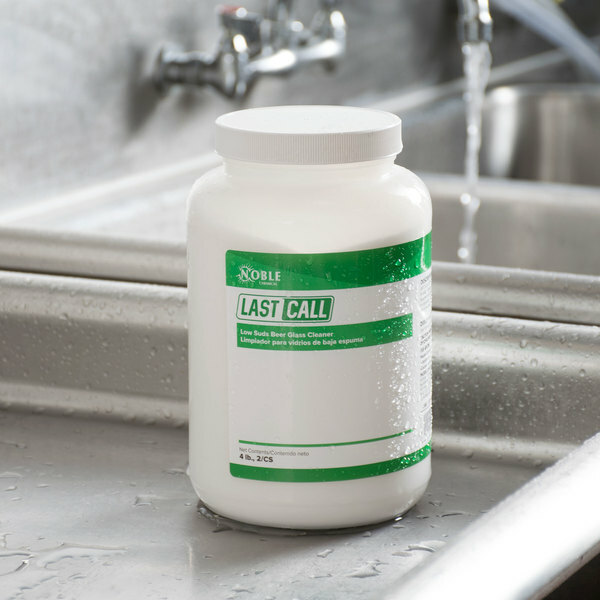 Last Call low suds bar glass cleaner. A great glass of beer starts with a clean glass. 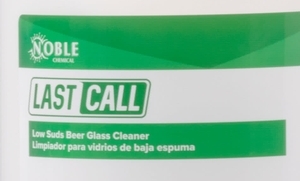 When your bar glasses are properly cleaned with Last Call bar glass cleaner, the beer you're serving will look and taste better, leading to increased profits. Plus, the beer will have a bigger, more impressive head, which won't go unnoticed by customers and guests! "Noble is a well-known company whose products work better than any other brand on the market. This product is one of their best products. It works better than I could have ever expected." 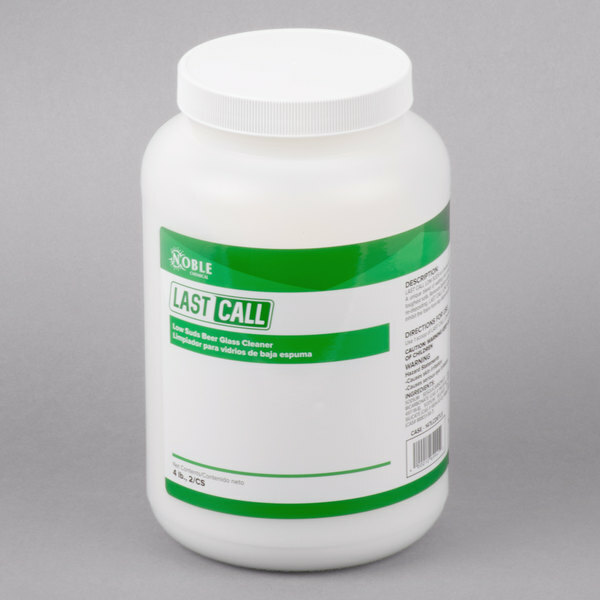 With a low sudsing formula and medium to heavy-duty cleaning power, it penetrates and suspends tough soils to prevent redepositing, then rinses completely to leave surfaces free of residue. 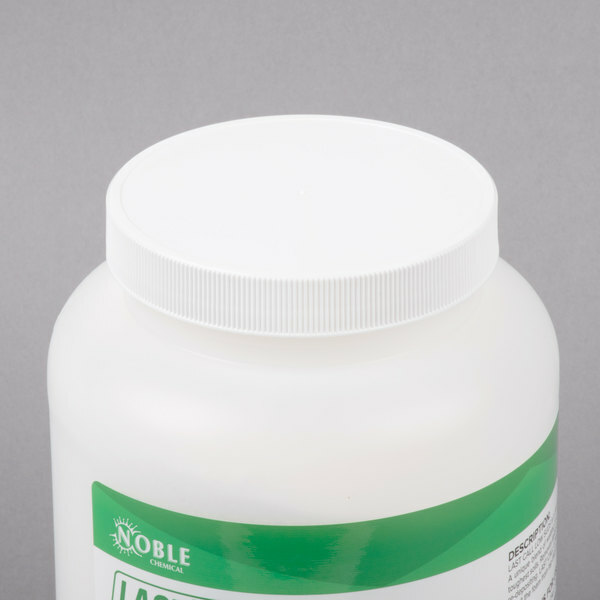 This powdered bar glass cleaner works well in all water hardness conditions. If a beer glass isn't cleaned properly, the invisible film left on the glass from the improper washing will "kill" the head of the beer. Beer glasses washed with Last Call beer glass cleaner have bigger heads which leads to more glasses of beer per barrel! Use it to clean your glassware after catered events, or at the end of a shift. With Noble Chemical Last Call bar glass cleaner, you can rest assured that your bar glasses are properly cleaned every time. It won't inhibit the foam or beer head from tap-dispensed beverages, making it ideal for bars, restaurants, lobby lounges, and banquet facilities. For easy, convenient use, each jug contains a 0.75 oz. scoop. 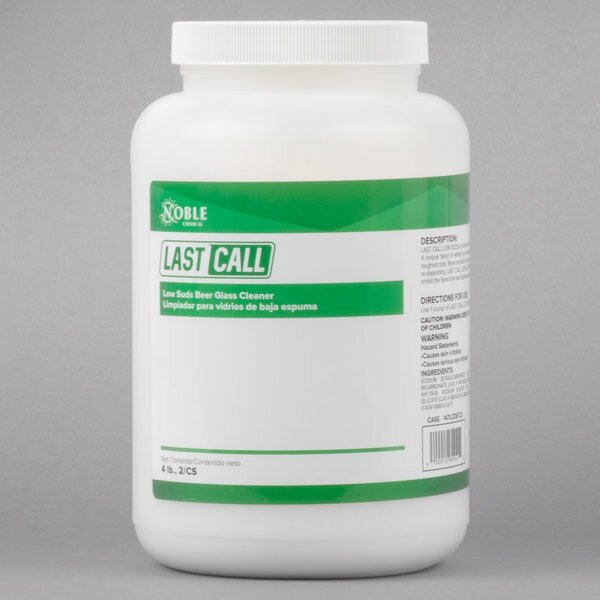 The recommended dilution is 1 scoop of Noble Chemical Last Call bar glass cleaner to 3 gallons water. Nice product at a good price. These go a long way. Have not noticed that much of a difference between the regular and low suds version in our applications. 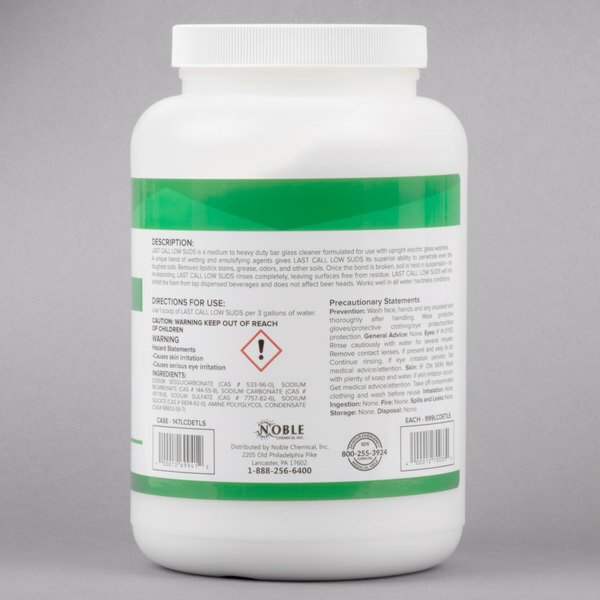 Noble is a well-known company whose products work better than any other brand on the market. This product is one of their best products. It works better than I could have ever expected.